As songwriters we’re all paying attention to lyric, melody, structure, rhyme scheme, groove, track and more. In coaching writers I usually find the last thing a young writer considers is “the idea”. What is the song about? Is it an idea that will make a listener want to discover the song, listen further and get you beyond the dreaded “nice” comment? Is it relatable? Sometimes it starts with a title, I admit to being a title writer. I think if the title gets people to listen to the song, open the book, try the movie then we have a leg up. Not to say that every great song has to have a clever title but it sure can help a co-write get off the ground, give your subconscious something to work on or make a publisher pick your CD out of the pile. I have to share one instance with you of a title really working. Years ago I moved to Nashville and while most of my success was in Pop music, especially in the UK at that time, I was getting country cuts. I was writing with Hall Of Fame songwriter Kye Fleming, still one of my best friends and the best pure lyricist I know. So.. we were stuck and she suggested we take a break in the middle of the day and go see a movie. We went to see Jerry Maguire. You remember, the “show me the money” movie. The theatre was mostly empty aside from a few songwriters and music folk we both knew. Midway through the movie René Zellweger looks at Tom Cruise and says...."you had me at hello”. Kye elbowed me and said, “watch this”. Sure enough 4 people got up and made their way out, in the middle of the movie. They knew they had found their idea, or the perfect title. In her wisdom Kye told me that they would all go write it, a couple will demo it, a few publishers will get it to producers and one will be a hit in 6 months! Around 6 months later Kenny Chesney had a number one called “you had me from hello”. I still keep a running list of anything that remotely sounds like an opening line, great title or just a good idea. One Nashville writer I know always cautioned me to “make sure the journey was worth the destination.” Don’t just depend on the twist or the hook to carry a song but make sure every part of lyric is seamless leading up to the big idea. In other words, a great title on it’s own is not a great lyric. Good advice! Mark Cawleys’ songs have appeared on more than 15 million records. Over a career based in LA, London and Nashville his songs have been recorded by an incredibly diverse range of artists. From Tina Turner, Joe Cocker, Wynonna, Diana Ross and Chaka Kahn to The Spice Girls, Tom Scott, Kathy Mattea, Paul Carrack, Will Downing and Pop Idol winners in the UK and around the world. He has had #1 records in the UK and throughout Europe as well as cut’s in Country, Jazz & R & B. His groundbreaking website “Song Journey” created with Hall of Fame writer Kye Fleming was the first to mentor writers from around the world one on one online. He is currently writing and publishing as well as helping writers and artists in the US, UK and Australia with a new one on one co-active coaching service. 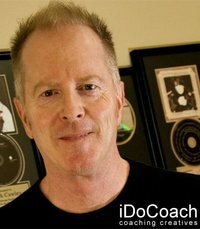 Visit www.idocoach.com for details.